South Asia comprises those countries lying between the Himalaya range of mountains and the Indian Ocean (north to south) and between the Ganga and Indus river valleys (east to west). The Indian Ocean shoreline is divided between the Arabian Sea (in the west) and the Bay of Bengal (in the east). 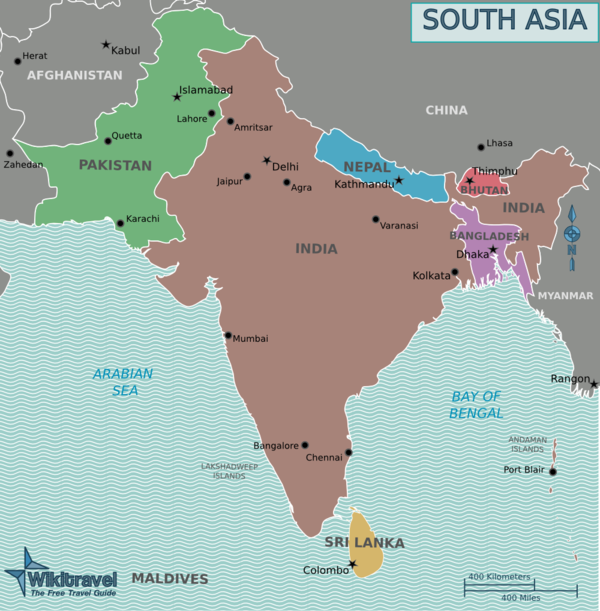 The extensive, triangular-shaped landmass of South Asia is sometimes referred to as "the South Asian Region", or "the South Asian Peninsula". Muslim nation from the Bengal region and home of beautiful mangroves. Famous for its rivers. Bangladesh is a country where rivers are highway! ancient and historical. Rich culture and traditions with multiple languages and over a billion live there. home to Mount Everest, adventure tourism, and smiling people. rich in Islamic culture, varying climates and terrains from hot deserts to mountains. Iran is occasionally considered a part of the region, but is predominantly in the Middle East. Afghanistan is sometimes considered part of the region and but often involves itself in South Asian regional organisations. Myanmar (formerly Burma) may be considered a part of South Asia for long-standing historical and political ties to India, but is usually categorised as being in Southeast Asia. Chennai - The city having the world's second longest natural urban beach. Kochi - The developed city in Kerala. Colombo - The city that never darkens. Delhi - The administrative capital of India. Dhaka - Four Hundred years old capital city and also famous for as a city of mosque. Kolkata - The cultural capital of India and former capital of the British Raj, Kolkata is a city full of culture and history. Male - The island city of beauty. See Islands of the Indian Ocean. Some commonalities exist in this area, mainly of climate and culture. Climate: Apart from the Himalaya, the climate is tropical, with monsoon in summer and dry winter. However, you have the extremes of this climate, i.e. in Western Pakistan monsoon is quite non-existent and in Southern India, it lasts for six months. Sri Lanka even has two monsoons, one in May, one in October/November. Culture: The influence of historical Indian culture can be seen everywhere. Two of the main "world religions" have their origins within South Asia: Hinduism and Buddhism. A third, Islam, was introduced by Muslim invaders starting around the 7th century and rose to prominence during the Mughal Empire. Population density: South Asia is one of the world's most densely populated regions - approximately 1.6 billion people (or roughly a quarter of humanity) make their home there. The average population density of 305 people per square km is 7 times the world average. The region does not have a lingua franca. However, as much of South Asia was under British rule, English is widely spoken by educated people. Hindi and Urdu are spoken over much of India and Pakistan. As the two languages are mutually intelligible, if you have to learn one before visiting, pick one of these. Hindi will also help you in Nepal, as the Nepali language is quite similar. Bengali is another major language spoken in Bangladesh, West Bengal and understood in some other eastern states of India (Assam, Meghalaya). Other than these, South Asia has a fascinating diversity of languages. India, in particular, is home to hundreds of them, and Pakistan too has quite a few. In the major cities and tourist destinations, you will be able to get by with English with varying degrees of difficulty. Many flights from the west coast of North America arrive via Singapore and Bangkok, while flights originating on the east coast usually have a stopover somewhere in Europe depending on the airline. Flights from Europe arrive via Dubai, Doha and several other major airline hubs. The number of direct flights between India and U.S/U.K is increasing. For most countries in the region, haggling is essential while shopping--see How to haggle. Save valuable travel money and help our environment. Buy your drinking water for the same price as locals do. If you or your group stays in a place for more than one day, buy your water in the biggest bottle possible. This will save your money! Drinking water comes in bottles much bigger than 1.5L, some of them have a tap that allow you to refill your own or your friend's smaller bottles. "Help! I would like a big reusable bottle of water. Where can I get it?" or "Water ... Drink ... Big ... Where?" ask this at the place you stay, where you are eating or other travellers where to buy cheap water or how to get it delivered. This page was last edited on 27 March 2019, at 08:56.